They were rugby heroes but became heroes of the battlefields. The 1914 team were hugely successful and included many players who had won three Grand Slams between 1908 and 1911. They were physically tough, and their front eight were known as the “terrible eight”. Many decades before the game turned professional, the players all worked in various trades, from scholars to coal miners. One of them, Jenkin Alban Davies from Aberaeron, was both captain and a Christian minister. 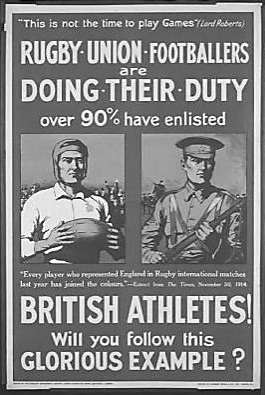 Six weeks after their game against Ireland, the First World War was declared, and the 15 players enlisted in the UK war effort. Among the players turned soldiers was Jack Wetter. He was awarded the Distinguished Conduct Medal as a Corporal in the 8th Battalion South Wales Borderers in Salonika, Greece for his gallantry in bringing in the wounded while in charge of stretcher bearers in December, 1916. He won 10 caps for Wales between 1914 and 1924, captaining his country three times. He died in 1967. Edgar Morgan who served as Second Lieutenant South Wales Borderers was awarded the Military Cross for capturing a machine-gun post in October 1918. 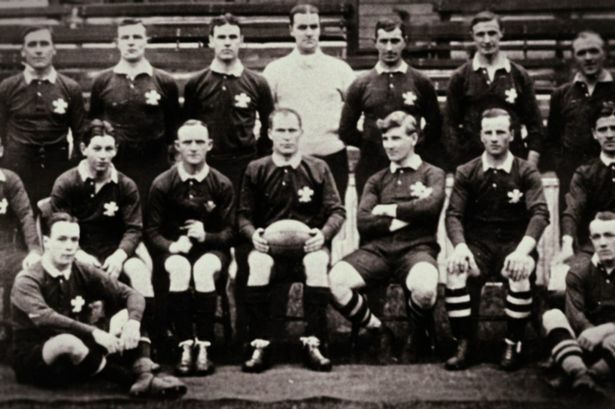 He won his four caps in 1914 and played in two tests against New Zealand on the 1908 Lions (Anglo-Welsh) tour. He also survived the war. John Morris Clement Lewis served as a Captain the 16 Battalion (Cardiff City) Welsh Regiment, 38th (Welsh) Division. He was wounded in the Battle of Pilckem Ridge but went on to play in the First Five Nations tournament after the First World War in 1920. *Maesteg Coal miner Dai Watts was killed in action in July 1916 just after the capture of Mametz Wood. His name is on the Thiepval Memorial to the missing of the Somme as his body was never found. One of the so-called terrible eight, Jenkin Alban Davies was Wales captain in 1914. He enlisted early in the war in the Royal Army Chaplain’s Department and served as Chaplain to the 6th Battalion of the Welsh Regiment and later became Chaplain to the Royal Field Artillery. He became a prison chaplain in South Africa after the war and emigrated to California. He died Los Angeles in 1976. Tom Williams (Swansea – forward six caps). Robert “Bobby” Lloyd(Pontypool – scrum-half seven caps).